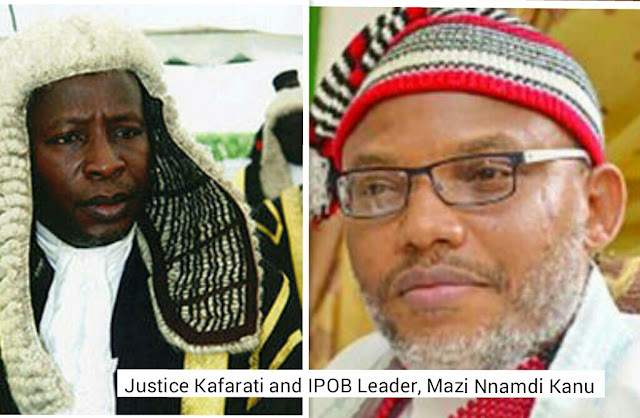 We the Indigenous People of Biafra (IPOB) under the command and leadership of Mazi Nnamdi Kanu wish to draw the attention of the world to the troubling absence of the presiding judge, Justice Kafarati, in the hearing of the application for the dismissal of the order he granted proscribing IPOB. What this underlines is a premeditated plot by the Attorney General of the Federation (AGF) Abubakar Malami to brazenly pervert the course of justice. Both the AGF and Justice Kafarati aided by their South East collaborators obtained an illegal backyard order banning IPOB activities,p but now the time has come for that order to be interrogated in an open court, the AGF has engineered the absence of Justice Kafarati from his own court so that the case will not be heard. From a brief interface with our lead counsel Bar. Ifeanyi Ejiofor within the premises of the Federal High Court Abuja on the 23rd day of October, 2017, we observed with deep concern the manifest case of perversion of justice by the AGF, acting in accord with the judiciary of Nigeria, to sustain the unsustainable tag of terrorism against IPOB until their illegality can find acceptability or justification in the eyes of the public with the passage of time. 1. The Ex-parte Order proscribing IPOB and designating it a terrorist group was applied for by the Federal Government on the 20th day of August 2017, and same was granted in chambers by the Acting Chief Judge of the Federal High Court. It should also be noted that hearing applications in chambers connote proceedings conducted with utmost secrecy without the respondent (IPOB) present. This procedure can only be used in limited circumstance as it is a process widely regarded within legal circles as inimical to the cardinal principle of fair hearing. 2. This Order was granted barely two (2) days after the Military Authority unilaterally and illegally declared that IPOB, is a “Terrorist Group”. This illegal declaration was promptly retracted by Lt. Gen. Tukur Buratai following the criticism that trailed their unconstitutional pronouncement. 3. On the 21st day of September 2017, counsel to IPOB (Bar. Ifeanyi Ejiofor) applied for the Certified True Copies of the processes filed and exhibits relied upon by the Federal Government. This request was approved same day by the Deputy Chief Registrar of the Federal High Court, who recommended the approval of the Acting Chief Judge of the Federal High Court be sought before the processes will be processed in line with the established practice of the Court and handed over to Bar. Ifeanyi Ejiofor. 4. The said application was never approved by the Acting Chief Judge, Justice Kafarati until 25 (Twenty-five days) later. This begs the question, why would Justice Kafarati who gave the order banning IPOB within 30 minutes, delay a full 25 days before approving an application challenging his ruling, if he was not biased. The application was filed by IPOB counsel on the 22nd day of August 2017, requesting the Court (Justice Kafarati) to vacate the Exparte Order he made on the 20th day of August 2017, purportedly proscribing IPOB. As was widely reported, the Government proceeded to gazette the Order the very same day the black market order was granted by Justice Kafarati, an obvious arrangement between the executive and judiciary to pervert the course of Justice. A communication was transmitted to the office of the Chief Judge on the 25th day of August 2017 by the IPOB Lawyer, informing him of the urgent need to assign a date for the hearing of the application. This application was ignored by the Justice Kafarati the Acting Chief Judge, as no date was given until 13 days after a reminder letter was sent to him and 15 days after the application was filed. It was on the 4th day of October 2017 that Justice Kafarati reluctantly scheduled the application for hearing on the 23rd day of October 2017. It is expected that a senior judge and Acting Chief Judge for that matter in the person of Justice Kafarati ought to be fully aware of his October official engagements/undertakings at the time he gave a date for the hearing of IPOB application. It is therefore baffling and most troubling that Justice Kafarati did not sit on the day the matter was scheduled for hearing, neither did his chambers communicate IPOB lawyers that the hearing will not hold. It is even more distressing when we reliably gathered that the office of the Attorney General of the Federation was in regular communication with the officials of the Court at the time a new date for the hearing was being arranged on the 23rd day of October 2017. Going by the above unethical antecedents of both Justice Kafarati the Acting Chief Judge and AGF Abubakar Malami, the hearing was deliberately fixed on a day Justice Kafarati knew he would be travelling outside the Nigeria for a one-week seminar. It is a known fact, even to the unintelligent that had Justice Kafarati sat on this matter on the 23rd day of October, 2017, the application seeking the dismissal of the Exparte Order he granted on the 20th day of September 2017, would have been granted, since same was not being challenged by the Attorney General of the Federation. The public must note this very crucial fact that as at today, Buhari's administration is yet to file a counter to IPOB submissions before the court. That being the case, it is assumed in law that they have no defense and therefore not contesting the application by IPOB. Had Justice Kafarati sat on the 23 October 2017, he would have had no choice in law than to rule in favour of IPOB by vacating his obnoxious order. It should also be noted that the office of the Attorney General of the Federation despite being duly served with the IPOB Lawyers’ application seeking the vacation of the Order proscribing IPOB on the 22nd day of August 2017, has never filed any Counter Affidavit in opposition to the IPOB application. This is the primary reason why Justice Kafarati claimed he traveled out of Nigeria. This will mark Nigeria out as one of those countries where a Chief Judge is actively colluding with the executive arm of the government to pervert the course of justice. Future developments, in this case, will no doubt reveal the conspiracy between the executive and judiciary to alter the natural course of justice. If the Attorney General of the Federation later files any response to the IPOB application on or before the 14th day of November 2017 that this matter is scheduled to be heard, then it will be an unimpeachable proof of manifest legal gang up between the executive and judicial arms of Government of Nigeria against IPOB. The absence of any legal representation from the office of the Attorney General of the Federation on the day this application was originally scheduled to be heard is the 23rd day of October 2017, has more to it than meets the eye. The entire civilised world is keenly watching as this drama unfolds. Our advice remains that the Acting Chief Judge should most humbly recuse himself from this case on grounds of manifest bias and conflict of interest.